Minister for Finance Michael Noonan chaired the meeting. EUROPEAN UNIONS FINANCE Union finance ministers failed early today to reach an agreement on how to close down failing banks before they can do too much damage to the wider economy. This resolution mechanism would have marked another important step toward a ‘banking union,’ the new overall EU regulatory framework meant to restore the banking sector to health and so prevent any repeat of the bloc’s debt crisis. 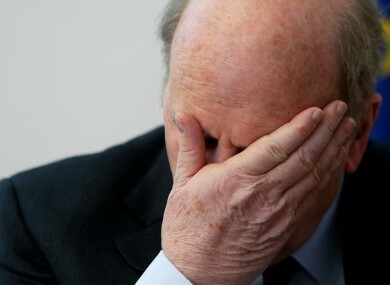 “We ran out of time … it is a very complex issue,” said Irish Finance Minister Michael Noonan, who chaired the meeting. “We made significant progress and differences were narrowed … but core issues were still to be resolved,” Noonan added after marathon talks which broke up in the small hours of Saturday. The 27 EU ministers will meet again Wednesday to try and finalise an accord before an EU leaders summit on Thursday and Friday, he added. After 18 hours of talks, the main sticking points were over how much the home country and creditors would have to contribute to the cost of winding up a problem bank. Noonan said some non-euro states naturally wanted more flexibility because they did not have access to rescue funding from the European Stability Mechanism, the eurozone’s backstop. At the same time, some eurozone states also wanted more leeway, among them France while Germany favoured a much tighter regime, EU sources said. France and Britain argue that rather than simply making all creditors pay their share, they should have discretion over who to include. A large company that is ‘bailed-in’ because of its exposure to a failed bank might be weakened as a result and this could have a harmful knock-on effect on the economy. Initially, the “talks introduced more flexibility but as they went on, that went too far for some,” one EU source said as the talks broke up. Hopes had been high that ministers would reach a deal to compliment a eurozone accord Thursday on how the ESM could inject funds into banks needing fresh capital but without adding to the already huge debt burden of member states. The two instruments were combined in the Banking Recovery and Resolution Directive (BRRD) that ministers discussed. Asked if the failure Saturday to agree the resolution instrument invalidated Thursday’s accord, Noonan stressed that it did not. Up to now, the taxpayer has paid for most of the state and bank bailouts – a massive sum put at €4.5 trillion for the 2008-11 period which has stoked growing popular disquiet and added to debt levels. To address this problem, the EU, the European Central Bank and the International Monetary Fund in March agreed a Cyprus rescue which ‘bailed-in’ larger depositors in its two biggest banks to pay for their restructuring. The EU initially set up the €500 billion ESM to bail out member states. But last June, when Spain’s banks looked near to collapse, Brussels extended its scope to allow direct aid for struggling lenders. Email “EU finance ministers fail to agree on who should pay for bank bailouts”. Feedback on “EU finance ministers fail to agree on who should pay for bank bailouts”.